Discover the magic of world-famous Muir Woods and the exciting wines of Sonoma County during this full-day combo tour from San Francisco. Get out and enjoy the fresh air before sipping on some of the best wines in the world as you sit back and let a knowledgeable guide show you around. Wander around hiking trails, visit two popular wineries and visit local shops on this unforgettable two-in-one Northern California adventure. After meeting up with your friendly and knowledgeable guide at your central San Francisco hotel in the morning, settle into your comfortable coach bus and head to Muir Woods for a few hours of exploring. 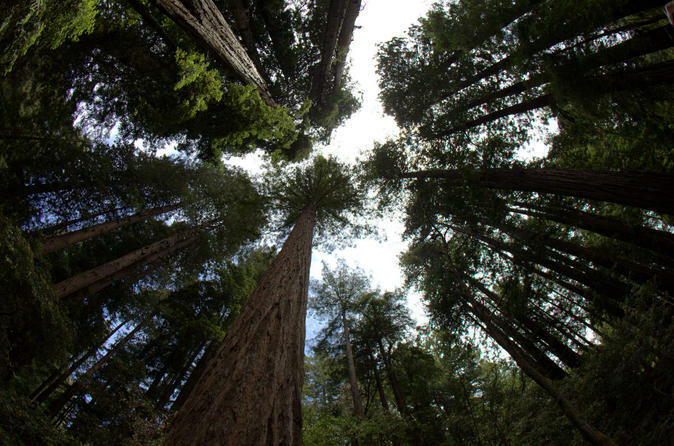 Wander the Muir Woods National Monument and its well-marked trails while marveling at the stunning old growth coastal Redwood trees that call the park home. Pop in the visitor center and bookstore or the gift shop for souvenirs or relax in the cafe with a cup of coffee. Head back to Sausalito for a half hour of exploring and shopping before getting ready for an exciting day of wine tasting. Admire the views as you drive through picturesque Sonoma valleys in a comfortable bus. Visit two of the area’s most popular wineries and enjoy one tastings included in the tour, the other tasting fee is on your own, but average of $15 per person per winery. After your full day of adventure, sit back and relax as you’re driven home in comfort. This small-group tour offers a personalized experience and is an excellent way to see two of the Bay Area’s most popular areas in one day.